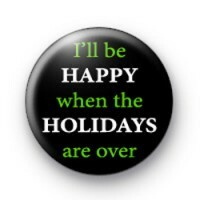 I'll be HAPPY when the HOLIDAYS are over badge in black with text in green and white. These anti-Christmas badges are perfect for all Christmas grinches out there. If you aren't a fan of Christmas & consider yourself a bit of an Ebenezer Scrooge, these are the perfect badges for you. We have a huge range of Christmas badges and anti-Christmas badges available on our website. Standard 25mm button badge made by hand in our UK workshop.